We are offering a great family package during weekdays only, during our Off Peak Periods. Only available to guests who book directly with Tiger Rock. A FOOD & FAMILY PACKAGE for a family group of 10 people*. ( Any combination of a maximum of 10 children & adults.) arriving together. You will be accommodated in the 4 rooms at Hill House. RM8000 for 2 nights/3 days- all inclusive accommodation, all meals & extras- for a family group of 10 adults & children. No decisions. Just relax & get taken care of as soon as you arrive in Lumut. Reconnect with nature and get to know the jungle, but we do have limited wifi. Bring your notebooks. Write down Bavanni's great Tiger Rock recipes & try them at home to get that Tiger Rock Family feeling . 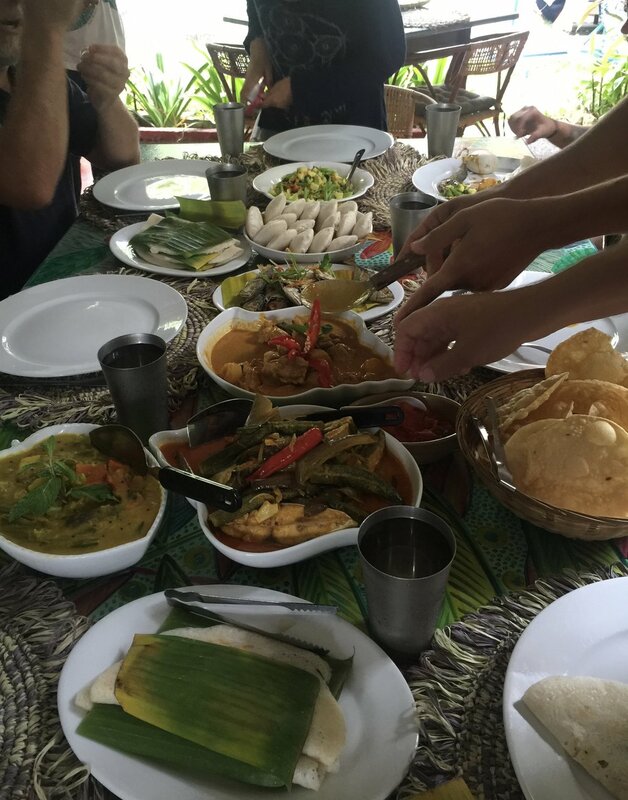 Family favourites include dishes like chicken tikka, chicken satay, fried rice, fried noodles, chill sauce, chicken curry, deep fried squid, pancakes, fried bananas, lemon chicken & steamed fish. - Through direct booking with Tiger Rock, & designed specifically for a big family group( not exceeding 10 persons in total) coming together. - Each family unit being made up of any combination of kids, parents and other family members. - During our Off Peak periods, weekdays only between March 31st to July 5th, & Sept 1st to December 14th. -Arrival should be arranged for lunch or late lunch on Day 1 in order to make the most of what we can offer you at Tiger Rock. ON arrival in Lumut, you do need to purchase your own ferry tickets & get onto the ferry. Inform Mohan of the departure of your ferry & he will be waiting to collect you at Pangkor Jetty. -pick up from Pangkor jetty & transfer to Tiger Rock. On departure, transfer to Pangkor jetty. -mocktails/cocktails or beer **Please note that inclusive evening cocktails or beer are limited to 1 per adult on the first evening only. All other alcoholic beverages over this amount will charged at the end of the stay. Please let us know what your kids like & dislike in terms of food. We also need to know if you have any specific diets to allergies to food. We want to ensure that we can satisfy everyone's mealtime needs ahead of time. Family bonding over wonderful food! Day 1- Arrival in Lumut/Marina Island before lunchtime. We need to know your ETA Lumut/ Marina Island before hand so that we can prepare for your arrival. You need to park your cars, buy the ferry tickets, get on the ferry & then inform us of the ferry departure time so that we can be sure to meet you on time at Pangkor Island jetty & transferred to Tiger Rock. Cocktail hour. Kids learn how to make their own mocktails. Day 2- Early start. Breakfast & island tour. See the local market streets, fishing jetties, the different temples, fish product factory & boat building. Return to Tiger Rock & refresh. Transfer to the beach/hike to a beach, for the afternoon. Dinner is served in an outdoors setting at poolside. Poolside relaxing. Part of the group may want to go to the beach or for a walk. Refresh, pack & prepare for departure. Transfer to Pangkor ferry terminal for return to reality. *See terms & conditions at end of page. Meals are served in the Pool House. - Package is applicable for both Malaysian & International Market. - Advance reservation & full payment is required upon confirmation. - Rooms are subject to availability. - Special Rate for extension night/s chargeable at RM800.00nett per couple per night & RM290 per child (Full Board). - Tiger Rock reserves the right to discontinue these packages at any time. - Any cancellation received within 14 days prior to arrival will incur 50% of the package charge. - Any cancellation received within 7 days prior to arrival will incur the full package charge. - Failure to arrive at the hotel will be treated as NO-SHOW and No Refund will be given.